Divest This Because someone has to say it. A recent story on the attempt by Students for Justice in Palestine (SJP) and their allies to bring their political opponents up on charges at UCLA included a comment on how SJP has been running amok all year on campus after campus. And if you look at what’s been happening the last few months, that description seems largely apt. First, you’ve seen the videos of student breakdowns and shout-outs when they didn’t get their way with the votes SJP forced on student councils, debates that let them rant and rave while sneering and howling at their opponents but did not leave them with much to show for one more year of effort. Much of this failure is simply due to the fact that the student body they yearn to speak for does not share their opinions, which is why the only “victories” SJP has managed to eke out came from student councils the Israeli haters have deliberately packed with people who will happily vote “Yes” on divestment, despite knowing that position represents nothing like campus consensus (which effectively strips those “Yes” votes of any meaning). The fact that no one considers student council votes on international affairs as representative of anything means that those all-night hate sessions have become an end in themselves since it allows the SJP types to engage in orgies of Israel hatred before a captive audience. But like the Apartheid Walls and mock checkpoints they routinely set up to harass students, such activity only manages to convince more and more people that SJP is nothing more than a bunch of rude fanatics. Now a normal political organization might step back and realize that such behavior is actually counter-productive to their cause. But as I’ve noted again and again on this blog, BDS is NOT a normal political movement. For the type of behavior we’ve seen on campuses, particularly in the last month or two, only makes sense when you realize that for SJP types, the student body is not a group of real human beings who need to be won over, but a set of extras (or props) meant to serve as a backdrop for anti-Israel agitprop performances. So why have things escalated in recent weeks, from eviction-notice stunts at Northeastern and NYU to the posting of Nazi propaganda images at Vassar to the recent attack on UCLA Israel supporters for daring to what the BDSers do all the time (i.e., tap into outside resources to support their political activity)? Part of the reason is that there haven’t really been any consequences for these student groups’ most egregious actions. Yes, SJP at Northeastern was suspended – but only temporarily. And while administrators at some schools have spoken out against the bullying that’s been taking place on campus, they have done so in language far meeker than what they used when condemning the ASA boycott (which is more about institutions and faculty than students). Some have characterized the lack of response by adult leaders at colleges and universities as feckless, and while I’m sympathetic to that view I’m also sympathetic to the plight of administrators who know SJP is ready to “lawyer up” (using those outside resources they insist cannot be used by their opponents) and make the lives of those trying to run a school living hell if SPJs are not allowed to continue doing whatever it wants (all in the name of the “free speech” that they routinely deny to others). Knowing there are unlikely to be genuine consequences for misbehavior is certainly a motivator for more misbehavior. And then you’ve got the instantaneous communication element brought into the equation by our old friend the Internet. For once one SJP group gets away with some outrage on one campus; word travels to all the others at the speed of electrons, providing a blueprint for what to do next. And keep in mind that while BDS storm-trooping and shouting matches may seem to us like surefire ways to put off potential allies, for the boycotters such tantrums – in and of themselves – represent success (which is why they proudly post and repost videos of their misbehavior all over that aforementioned Internet). Beyond such rules and mechanics, however, SJP going so over the top on campus after campus is also a demonstration of impotent rage. For once you get past all the noise, what has this latest incarnation of the permanent anti-Israel hate presence on campus actually accomplished since Students for Justice in Palestine came into existence? Winning divestment votes in student councils, their only activity that involves convincing (rather than harassing) others, has pretty much been a bust, even during an era when no one takes seriously the notion that such votes represent campus opinion. Their “You-Must-Listen-to-Me-and-Do-What-I-Say-Because-I’m-So-Angry” routine is well past the sell-by date for most students. And pro-Israel organizations, despite being harassed for existing, are stronger than ever on US college campuses, just as the Israeli economy the boycotters are trying to wreck has gone from strength to strength to strength. Finally, while impotent rage is a powerful driver for more and more misbehavior, remember that the rules for radicals tend to be applied both by and to fanatical organizations like Students for Justice in Palestine. What this means is that these types of groups tend to attract fanatics and since political fervor is their main currency of respect, the most fanatical tend to end up in positions of leadership. And just as BDS groups routinely try to infiltrate other organizations in order to speak in their name, these same groups must endlessly fend of infiltration by other radical individuals and organizations (often with ties to a particular strand of Left/Right – Secular/Religious radicalism within the Middle East itself). This is the dynamic that ultimately destroyed the Palestinian Solidarity Movement (PSM), the go-to group for anti-Israel agitation that spearheaded campus divestment activity in the early 2000s. For just as the divestment tactic was starting to run out of gas, PSM leaders found themselves spending a majority of their time writing and enforcing rules that would keep people even nuttier than themselves from taking over – an effort that finally ended in the group’s demise. SJP may have avoided PSM’s fate (at least temporarily) by not saying “No” to anyone, no matter what lunacy them demand the group engage in. But as their anti-democratic, anti-peace, anti-justice and anti-student behavior becomes more and more obvious to all, it may just be a matter of time before this latest incarnation of campus “I Hate Israelism” implodes, joining PSM on the list of now-forgotten acronyms. Very good. In fact their crazy behaviour is a benefit to us and not just by SJP. It shows the student bodies that these people are willing to do anything and use the Student Councils, their budgets and the democratic process to make these groups their own plaything, and could care less about what they are actually voted in to do, manage student affairs. 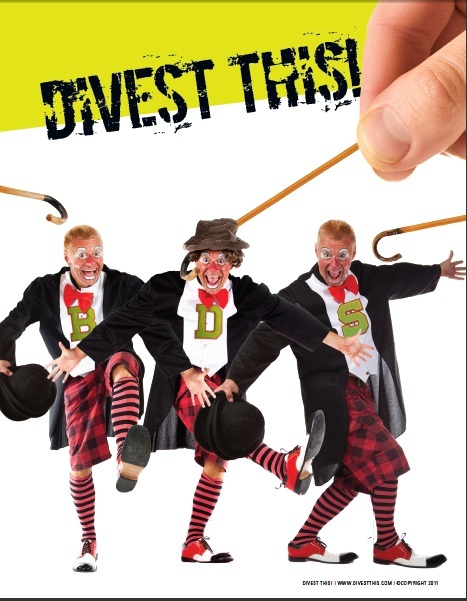 Enter your email address to subscribe to Divest This and receive notifications of new posts by email. © 2019 Divest This. All Rights Reserved.